Bitcoin has posted two consecutive months of losses. This is no news to Bitcoin holders. However, it is important to keep in mind that sometimes you need to lose some battles in order to win the war and I think this is exactly what the bulls are thinking right now. During the past two months, the Bitcoin price traded in a tight range between $7820 - $5887. Last month’s low at $6108 was higher than August’s low at $5887. This confirms that there is a clear trend. The fact that we are forming a higher low satisfies the definition of an upward trend to some extent. According to technical analysis, the exact definition of an upward trend is a confirmation of higher highs and higher lows. Currently, we do not have a confirmation of higher highs, as September's high ($7405) was lower than August’s high of $7820. However, the most important fact is that the closing price of Bitcoin for the third quarter at $6,643 was higher than the opening price of the quarter ($6,313). This gives a very clear indication that the price may have lost some battles, but it has won the war over the period of the third quarter. The 3.34% quarterly gain for Bitcoin could have been a lot more significant, but that’s only if the fundamentals were more favorable. The approval of the Bitcoin ETF, for example, would have been a key event in favor of its price. But today is not the day to talk about Bitcoin alone. 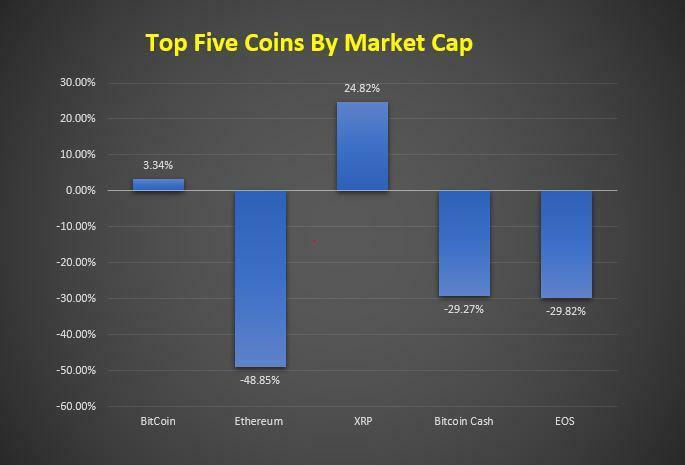 We have started the fourth quarter and it is important to see how the overall performance has been for the top five coins by market cap. If we compare their performance in Q2 and Q3, it becomes obvious that Ripple is the clear winner. In fact, its currency is largely responsible for pulling the weight of the entire industry during the month of September. 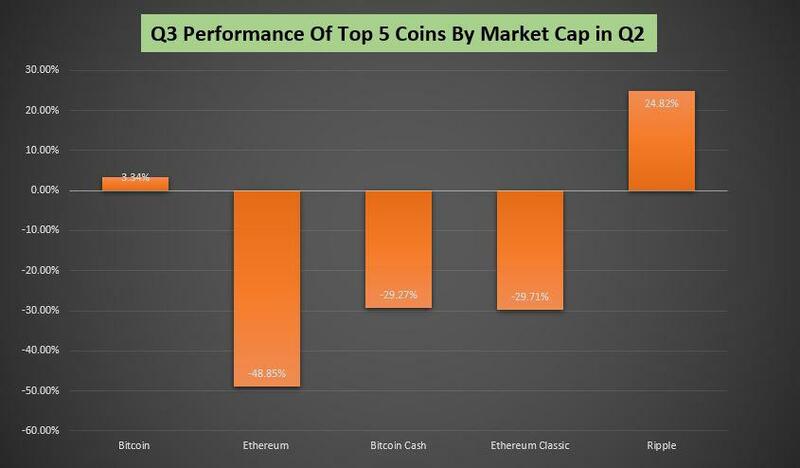 Among the top five performers by market cap in Q2, Ethereum performed the worst in Q3, down nearly 48.85%. The most outstanding event in the crypto-markets in Q3 was Ripple's XRP taking the second position in terms of market cap, even if it was short-lived. But what is not short-lived is the fact that Ethereum classic has moved out of the top five coins in the market cap list. Which coin has taken its place? Yes, you have guessed it correctly. It is EOS. Its community is gathering up a lot of momentum, which is why it moved up to the top five coins by market cap. 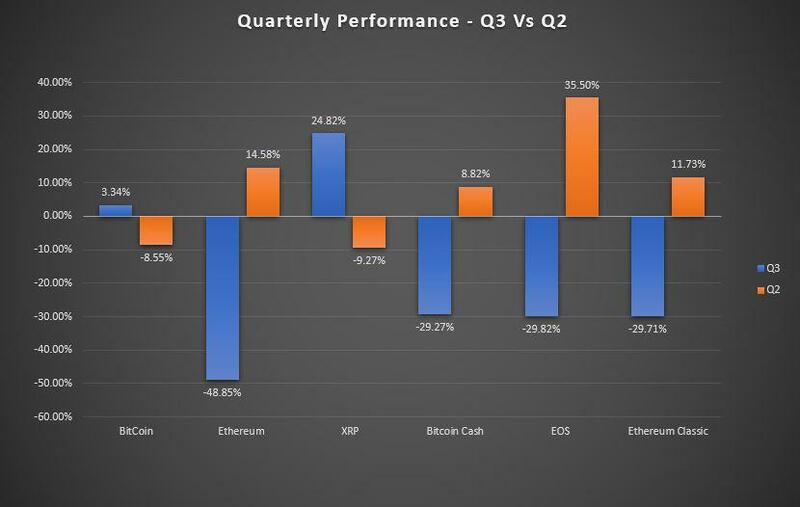 Having said this, it is worth noting that the quarterly performance of the coin was disappointing, down nearly -29.82% in the third quarter. If we compare the performance of the third quarter to the second quarter, it further becomes clear that EOS has become stronger. But, out of the top 4 coins by market cap, it is still Ripple’s team that has worked hard in silence and their success is making the noise. Bitcoin Stash: Legit Bitcoin Cash (BCH) Hard Fork Cryptocurrency?